If you aren’t already familiar with FrezyDerm it’s an established Greek brand founded in 1986. 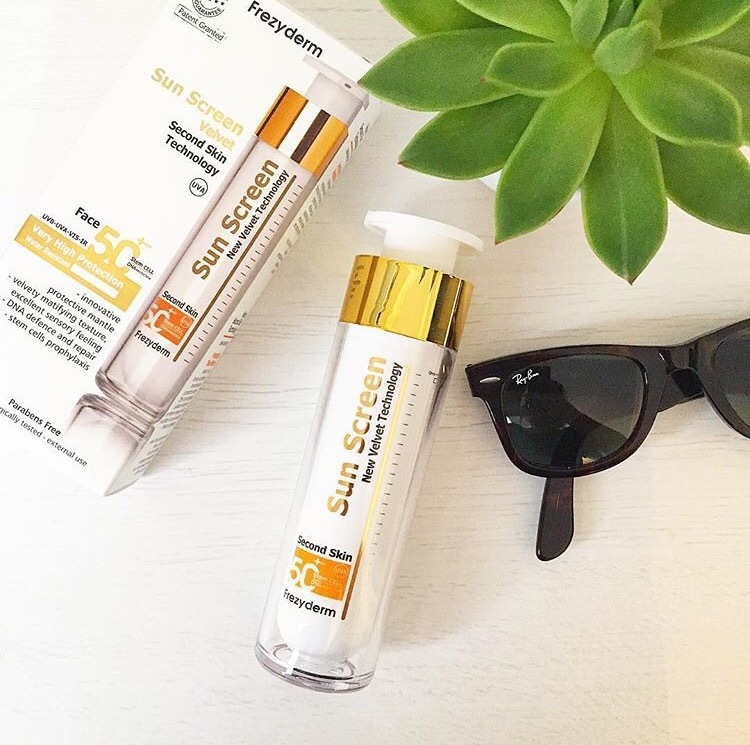 I’ve received their breakthrough Sun Screen Velvet Face SPF 50+ which I’m really happy to try out and review. The packaging is very smart and clinical looking which I think is attractive to both men/women and all ages. The shape of the bottle is easy to use and lightweight. It’s got a pump dispencer that you can twist to lock and it’s 50ml so it ticks all the boxes for travelling or just having in your handbag. The product texture is a transparent gel that does not smell. It’s like NOTHING I’ve ever tried before. OMG it is incredible! A couple of pumps spreads evenly like a second velvet skin (that’ll be the revolutionary second skin technology innovation) It is an instant matte finish with no white marks or greasy residue. It doubles up as the perfect make-up base. I noticed my tinted moisturiser went on better and stayed put for much longer. And if that wasn’t enough my skin looked fresher and it blurred my fine lines and imperfections – win win win. I also tried it on it’s own while sunning myself in my garden for a naughty couple of hours during the recent heat wave. In 30 degrees heat this sun screen did not melt nor did it make my skin feel uncomfortable or sweaty like other sun creams. It continued to stay matte, protect my skin and allow it to breathe. I absolutely love this sun screen, I’m so impressed with it’s performance it delivers on all of it’s promises. I recommend it to anyone looking for a new SPF and think it will suit all ages/skin types.